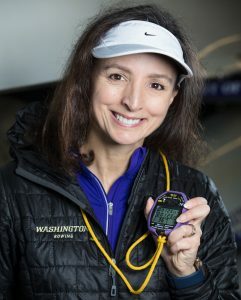 Farooq, a former University of Wisconsin All-American turned Olympic coxswain, is now the head coach of women's crew at the UW. We asked her about the future of Husky rowing. 1. Why did you leave Stanford for the UW? This is Rowing U. The UW is the heart of the rowing world. I loved Stanford but being here is the pinnacle of my career. 2. What is your coaching style? I model my teams after the U.S. national team—that means endurance, not power, is the key. We will teach our team not to pull so hard all the time. That will allow them to get more oxygen into their muscles. 3. You say the UW is the most unique rowing program in the world. Explain. I marvel at the number of walk-ons who are so successful here. We recruit more walk-ons than any other top-10 school. We put up posters all over campus. Several hundred students turn out. They want to be part of this legacy. 4. You are in the National Rowing Hall of Fame. Does your team know that? If you want to be impressed, come inside Conibear Shellhouse and you’ll see the number of Olympic gold medals Huskies have won on display. That says it all. 5. What do you think of your team? We have a lot of depth and some very motivated rowers. Also, they are tough! And they are willing to work hard. They know what it means to be a rower here. They will learn how to win.